Extreame Savings Item! Save 44% on the Alimens & Gentle Twilled Texture Bussiness Men's Dress Shirt Short Sleeve Regular Fit - Color Blue, Size: 3XL/19.5 Neck by Alimens & Gentle at Common Wealth. MPN: A-DX1007-7-50-150-19.5. Hurry! Limited time offer. Offer valid only while supplies last. Twilled Texture Variety Colors Short Sleeve Dress Shirts. Spread Collar, Pocket at Chest. 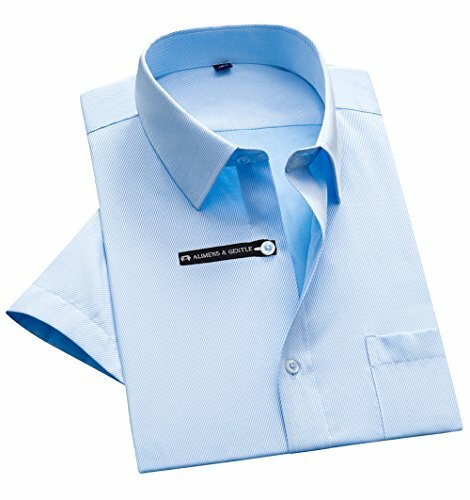 Regular Fit Basic Design Dress Shirt Suitable for All Occasions. If You Have Any Questions In The Shopping, Please Contact Us Promptly, We Will Solve The Problem in Time.